Selecting your Perfect Wedding Gown can be tough. Remember, this is supposed to be fun. How many times do you get to have the adventure of picking the dress for the biggest day in your life? It is always best to go with your intuition, with the way you feel about the dress. It is very hard to pick the right one because there are a lot of choices. Go ahead and read through our advice below on how to select your perfect wedding gown. Do you have your team? There is more than one way to go about looking for your wedding gown. First thing first, you will need to have a strong support group to give you feedback. Close family and friends will give you the much needed feedback to narrow down the choices. These people will give you constructive criticism that you might now want to hear. That is a good thing. Sometimes the person in charge of your gown consultation might steer you in the wrong direction. The sales person should be there to find the dress that you need. Their advice holds merit, but keep in mind that your loved ones know best. It can take months to get it down to your favorite. The sales rep should be understanding and not rush you to make a decision. This wedding dress will have to not only fit your style but make you glow! 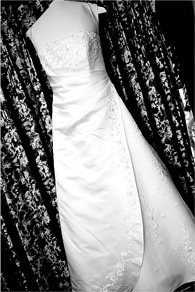 A good time frame is to have your gown selected about six – seven months before the big day. It will take you several months to pick the appropriate dress. Giving yourself enough time will also help keep your gown shopping within the budget. Anytime you force your decision, it will results in rush charges and costly alterations. It’s not bad advice to be fitted prior to your wedding date. You will be wearing this dress for an extended period of time, shouldn’t it fit comfortably? You will want to pose, dance, and have a great time while in your gown. A common tip is to tell your sales rep your reception is actually a week earlier, this way if there are any mishaps, then you can make adjustments the week of. Some people will try to reduce the cost of paying for a brand new dress. It you fit into this category, then you might consider wearing something that was previously used by a family member. It can always be altered down the road, or modified to compliment your figure. This is a common tactic for more mature brides, they avoid the excessive costs and choose something more common. As done up as you want, it can also be low key. Once again, this your decision and it is based on your budget and goals. Going back to what I said earlier, stick with your instinct. If you fall in love with the dress, think of reasons why you shouldn’t have it. If you can’t think of any and it fits then it is a possible candidate. Whenever you find that dress that screams you look at the price tag. It is very easy to fall in love with a gown that is out of your price range. If the wedding dress is very important to you, then you might have to restructure parts of your budget (ie cut back on the videographer and put more towards the gown). If you have family contributing financially you will also want to get their feedback on any budget adjustments. Another way tech savvy brides have been securing their dress is through online vendors. You can get possibly anything imaginable through these sources. Information is available with just the click of a button. You can even take these online photos to your local tailor to get an idea of how much the alterations would cost. There is no right way to go about the whole process. Everyone dress is different and because of that you will have to decide which one is right for you. The sooner you pick the gown, the less stress you will have down the road as you get closer to your wedding date. Try to have those important to you help you with gown shopping. Remember, that these people might not sugar coat their opinion. Most importantly, make sure you love the dress and it fits you comfortably.